The White House has refused to back down after revoking CNN reporter Jim Acosta’s access despite a backlash from the journalist community and claims that the video of the argument had been altered. “The question is: did the reporter make contact or not? The video is clear, he did. We stand by our statement,” the statement from the White House press service reads. Press Secretary Sarah Sanders earlier defended the ban on Twitter, posting a video which was reportedly first shared by the conspiracy theory website InfoWars. ​Research Director of the Tow Center for Digital Journalism at Columbia University Jonathan Albright and other observers later said the clip was likely doctored to make Acosta appear more aggressive than he actually was. The White House News Photographers Association called Sander’s actions unethical. — Oliver Darcy (@oliverdarcy) 8 ноября 2018 г. ​However, InfoWars video producer Paul Joseph Watson called allegations a “brazen lie”. 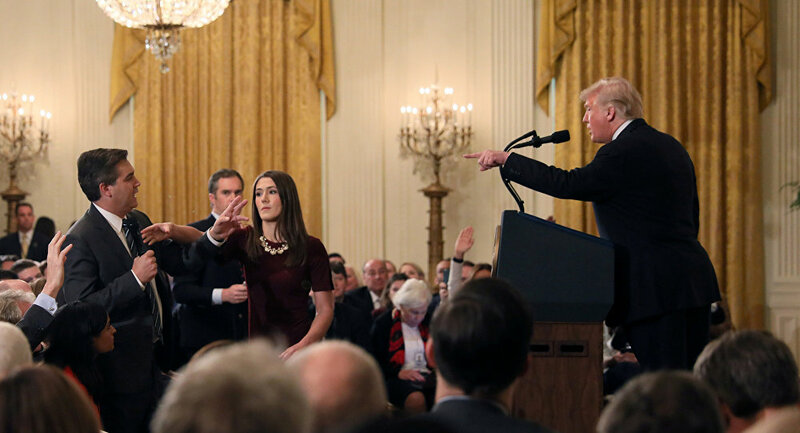 Questioning Donald Trump during a press conference after the US midterm elections, Acosta aggressively pressed for answers, even when the US president had moved on to other reporters. It prompted a heated argument, and when a White House intern took the microphone away from Acosta, he wasn’t eager to let go. Trump called the journalist a "rude terrible person" and accused his network CNN of reporting "fake news." Later Sarah Sanders tweeted that Acosta had been "placing hands" on the intern. She promised to revoke Acosta's White House pass until further notice and slammed Acosta’s employer. “The fact that CNN is proud of the way their employee behaved is not only disgusting, it‘s an example of their outrageous disregard for everyone, including young women who work in this Administration,” she said. Reacting to the incident, CNN lambasted the ban as retaliation and accused Sanders of lying. ​The decision drew a fierce backlash from the journalistic community. The White House Correspondents Association called on the White House to "immediately reverse this weak and misguided action" and accused Sarah Sanders of lying. The Committee to Protect Journalists (CPJ) slammed the White House for the move as well. "The White House should immediately reinstate Jim Acosta's press pass, and refrain from punishing reporters by revoking their access — that's not how a free press works," their statement says.